The new redesigned women's Challenger wetsuit from Aqua Sphere has been upgraded to Yamamoto 39 neoprene throughout the entire suit. The Aqua Sphere Challenger tri wetsuit provides excellent levels of performance and comfort for your open water swimming. Whether you're participating in a triathlon, or taking on a wild swimming challenge, the Challenger wetsuit will help to see you through to the finish in record time! Packed with high-tech features and manufactured from the best quality Yamamoto neoprene, Aqua Sphere triathlon wetsuits deliver reduced drag whilst maintaining durability and flexibility. The suit incorporates Bio-stretch zones designed to give the swimmer greater freedom of movement for all swimming strokes. Packed with high tech features and manufactured from the best quality Yamamoto neoprene, Aqua Sphere triathlon wetsuits deliver reduced drag whilst maintaining durability and flexibility. The suit incorporates Bio-stretch zones designed to give the swimmer greater freedom of movement for all swimming strokes. Aqua-Grip™ Cuffs and Aqua-Flex™ Collar: Prevent water from leaking in, keeping you warm and preventing distraction during your swim. 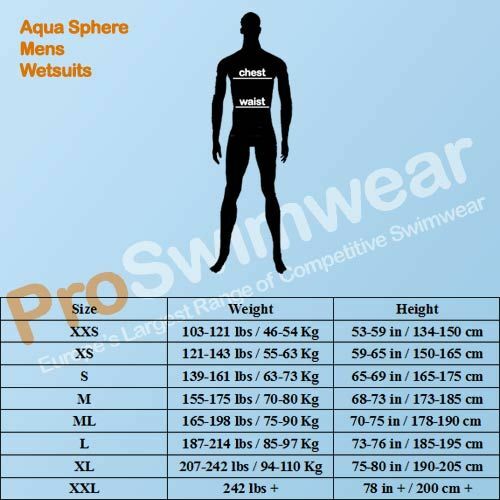 Aqua Drive: The core of the wetsuit acts as the primary planing surface while swimming. Aqua Drive technology optimizes your body position in the water through the use of strategically placed neoprene panels. These panels add buoyancy in targeted zones so that your body position is higher in the water, reducing drag and increasing your efficiency! SCS Coating: The Challenger wetsuit glides through the water more efficiently thanks to the SCS, or Super Composite Skin coating. The hydrodynamic coating improves your speed in the water by reducing drag/resistance . SCS has ultra low friction, helping to improve the neoprene's durability, strength and surface abrasion properties. Bio-Stretch Zone: Strategically placed stretch zones allow for greater freedom of movement for swimmers. Thermo Guard: A 5mm thick core panel helps to retain body heat during cold water swims. Quick Release Ankle Panels: During a triathlon, every second counts. The quick-release panels on the ankles ensure a quick transition time. Easy-Pull Deep Back Zipper: Another time saving addition for a speedy transition from the swim to cycle phase of your triathlon. 100% UV Protection: The sleeveless wetsuit provides 100% UV protection, useful if you're taking part in an Ironman distance swim this summer. Material: Yamamoto 39 super stretch neoprene.